Just over two weeks ago the Sichuan province of China was hit by its deadliest earthquake in over 3 decades, measuring between 8.0 – 8.3 on the Richter Scale. Since then there’s been a further 52 major aftershocks with experts predicting more of the same in the coming weeks and months. To date almost 63,000 people have been confirmed dead and around 300,000 others injured. In addition to the tragic loss of human life, millions are now homeless and without adequete resources to recover from the disaster. Schools, hospitals and libraries have also been destroyed, leaving millions without a place to call their own. 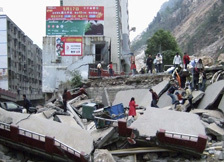 The Chinese American Librarians Assocation (CALA) has set up a website where you can contribute towards the Earthquake Relief Fund. Click here to make a donation. Found via American Libraries Association Newsletter. Image courtesy of Mercy Corps. In previous posts I’ve championed librarians as everyday heroes so imagine my joy when I stumbled upon this lovely article via the ALA newsletter. A self proclaimed superhero junkie and librarian has pulled together a brief overview of ‘superhero librarians’, including well known characters such as Batgirl and lesser known heroes such as Xi’an “Shan” Coy Manh and Blok. There’s also a link to a really cool resource called Librarians in Comics for anybody keen to develop an understanding of the historical role librarians played in fighting the forces of evil in comic books.